Juventus are doing big things in the Italian Serie A at the moment. After a rough start to the season, with two losses (Udinese, Roma) and a draw (Chievo), Juventus seem to have finally got things right and are back to their best. The Old Lady is on an 11 game winning streak, having most recently beaten Roma 1-0 over the weekend. Massimiliano Allegri's team is now 2nd in the standings, two points behind first place Napoli. The odds are that Juve will finish the season on top. There were a lot of changes at Juventus this summer. Andreas Pirlo, Arturo Vidal and Carlos Tevez, the trio that played a big part in bringing the club to the Champions League final last May, have all departed. 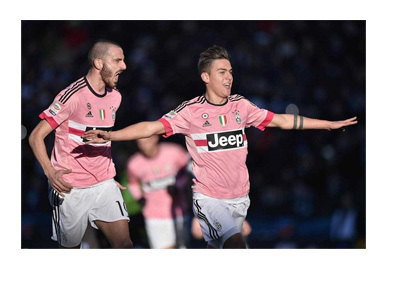 This, fortunately for Juve fans, freed up space for the emergence of a new football sensation, the twenty two year old Argentine Paulo Dybala. Dybala is a breath of fresh air in Italian football right now. The left footed striker has been involved in a large percentage of goals for Juve this season. He has 8 goals and 5 assists in his last 11 games alone. Also playing well for Juve are the team captain and legendary goalkeeper Gianluigi Buffon, as well as the French superstar midfielder Paul Pogba, one of the world's most talented young players. Next up for Juventus is a Coppa Italia semi-final first leg match vs. Inter Milan, coming up on Wednesday, January 20th. The big league game vs. Napoli is on February 13th, followed by an even bigger Round of 16 UEFA Champions League first leg clash vs. Bayern Munich on the 23rd. Juventus are a team in form right now. Let's see how the rest of the season plays out for the Bianconeri.